Londoners and visitors to the capital are invited to view an exhibition this week documenting the cultural links between Beijing and London. Beijing to London: the flame lives on is a joint venture between the Mayor's office and the Chinese Embassy, taking place between 24 and 27 November and is being hosted by the London Development Agency (LDA) and Transport for London (TfL). The exhibition documents the preparation for and delivery of the Beijing Games, plus Team China and Team GB's performances - as well as our own preparations for London 2012. "I was privileged to represent the Mayor at the opening of this summer's Olympic Games in Beijing and we are delighted to support this exhibition, which celebrates the special link between Beijing and London as successive Olympic and Paralympic host cities. The Beijing Games were wonderful to see at first hand and this exhibition is a tribute to the extraordinary achievements of Team GB, Team China and all international athletes. Both London and Beijing are committed to using this common bond to further strengthen and deepen our already excellent relationship." The exhibition will be enjoyed by those interested in both Chinese and British Olympic triumphs and will symbolise the passing of the Olympic Games, and its legacy, from Beijing to London. The photographs at the exhibition will depict spectacular moments of the Beijing Games – the opening and closing ceremonies in the infamous Bird's Nest, as well as various performances and action-shots of the participating athletes. 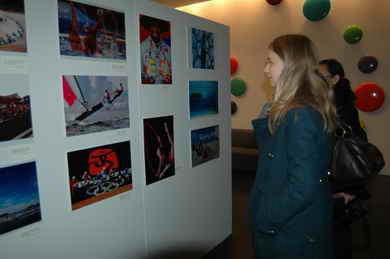 Photographic exhibition, organised in conjunction with the Chinese Embassy, featuring striking images from the Olympic and Paralympic Games in Beijing. The exhibition is free. For media enquiries, please contact Sarita Bhatia at the LDA Media Team on 020 7593 8087; for public enquiries, please call 020 7593 9000; for out of hours media enquiries, please call 07977 439 371. The London Development Agency aims to improve the quality of life for all Londoners - working to create jobs, develop skills and promote economic growth.